As the technology prophets will tell you, the connected smart home is fast becoming more of a reality than science fiction, technology start-ups worldwide are innovating at an unprecedented rate and the internet of things is in full swing. The internet of things stretches beyond your smartphone or tablets to everyday appliances, from your washing machine to your crock pot, your lock to your toilet. Each item is connected to the web and monitors the data in your life for maximum utility. Nowhere will this be more efficient than in the family home. A decade and a half later – we’re at the dawn of this age. The key to success as a product in this increasingly competitive environment is going to rest on a number of key characteristics. Design has become fundamentally integral to the success of innovative products in recent years, a supremely functional brick will bear no appeal to the design savvy Luddite, Apple has changed the aesthetics of an entire industry in a decade and incumbents will ignore it at their peril. The same philosophy applies to functionality; the connected home must be simple, seamless and invisible. If there is one aspect of life in 2025 that Spike Jonze’s Oscar winning film “Her” got right it’s that technology was everywhere and nowhere, enabling a million processes at once without interfering with actually getting on with the business of being a human. The first step in this process must be the installation; the connected home will thrive off plug and play devices that can slot into the existing infrastructure without the owner possessing expert technical knowledge. So what can we expect the smart home to look like, not in 20 years, not in 10 years, but in 5, and what are the products currently available that are going to take us there? We can start with that harbinger of technical innovation, the humble light globe. Two companies are leading the charge in this space, Belkin with its WeMo range and Phillips with its Hue family. Phillips is aesthetically and technically the stronger of the two, but it comes with a higher price tag. The Hue allows you to control your entire home lighting system from your tablet or smartphone, inside the home or out. Unlike other smart bulbs, the Hue is capable of reproducing up to 16 million colours. Fancy that quasi red, warm golden haze so vividly recreated by cinematographer Hoyte Van Hoytema in Her? The Phillips Hue and accompanying app will take you there. The lights are programmable to dim on when you wake up and turn off when you leave amongst a whole host of other settings. If for novelty’s sake you want to make the all the houses lights go bezerk when your football team scores, you can through “If this then that” (IFTTT) recipes. “In the way phones, media and entertainment have been revolutionised by digital technology, now we can personalise light and enjoy limitless applications,” said Phillips’ Head of Strategy, Jeroen de Waal. Phillips’ biggest competition in this area is Belkin, the WeMo range does not allow for limitless colour, just your standard incandescent in this case, but it is significantly cheaper and it does retain personalised settings and IFTTT capability. The biggest advantage that the WeMo has is its integration with the wider range of WeMo appliances. From power points to motion sensors – Belkin is going for much more than just the light globe. They’ve currently got a monopoly on the connected crockpot market. You could hardly imagine a more passive way to whip up dinner, the lazy boy equivalent of the kitchen, the connected WeMo crockpot will let you thrown in that pork shoulder, a few spices, a couple of vegies and be on your merry way to work or the pub. All you do is set the heat and cooking time via your smartphone and come back to that oh-so-Surry Hills Mexican renaissance feast you’ve been kept constantly updated about via your smart device over a couple of pints. Yeah, the Crockpot may not be the second coming of the domestic king you once where but when you throw it in the mix with the smart sensing fabric from Cityzen Sciences, the smart fridge from LG or the smart washing machine from Samsung, then your well on your way to leading a more efficient existence. So when all of this not having to make decisions for yourself leads to a bit of overheating on your person, you’ll be thanking your lucky stars that Nest is in charge of your thermostat. Google famously acquired Nest to the tune of $3.2 billion last year as part of its Schlieffen plan to dominate the smart living room. Gartner research predicts that over 26 billion devices will be connected to the internet by 2020, and Google looks set to take up a piece of the market. But why Nest and why smart thermostats? First of all, it exemplifies the first two characteristics of good smart home devices; they are beautiful and offer seamless installation and use. Both of these factors help to differentiate them from rival Ecobee, which lacks both design finesse and ease of installation. Secondly, like Ecobee, Nest learns your schedule simply by you using it. It will know what temperatures you like at certain times and when you leave the house, Nest claims that it could save up to 20% off your energy bill by replacing your current thermostat. Still, a thermostat alone seems like a stretch for a $3.2 billion investment. So why invest that much money? What Google really got with Nest was their CEO, the much lauded hardware genius, Tony Faddell, better known as the designer of the iPod. As Nest and Google work together to bring more innovation into this space you can be sure that their “Internet of Things,” will go far beyond the thermostat and into what Fadell calls “the conscious home,” where companies will know what we do even when are not on the web. As more devices are added to the line-up it will create an ecosystem that once entrenched will be very difficult to get out of, the attachment of Apple fans to Apple is a key example of this. So where does the smart device live next in the smart home? One area that Google might have its eyes on is the smart-lock. 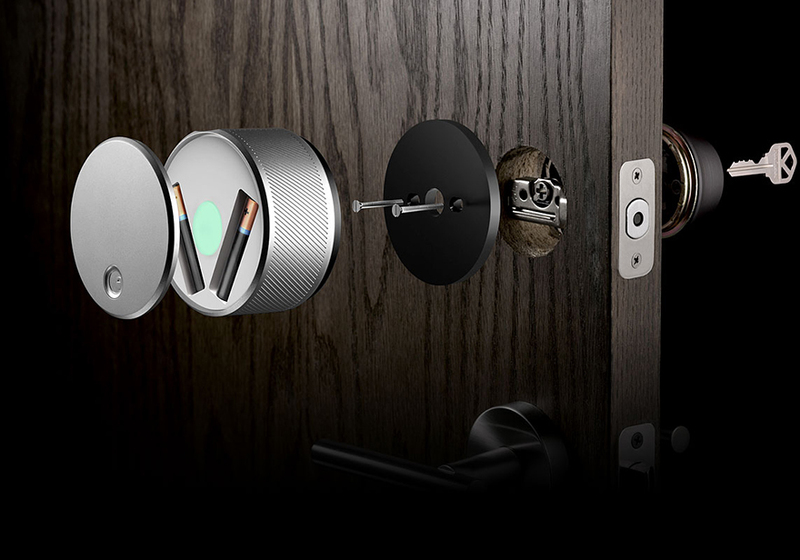 San Francisco start-up August looks to be the front runner in smart home lock automation. There are competitors in Lockitron and Goji, but once again, on the two principal characteristics of successful smart home devices, design and ease of use, the August wins out. Like Nest, the founders, Jason Johnson and Yves Behar come with both technical and design experience. Johnson was the former VP of Dolby laboratories and Behar the chief creative officer at Jawbone. The August lock works on existing deadbolts through a Bluetooth enabled locking mechanism via a smartphone application. It allows you to send a virtual key to anyone you want to have access to your home. The door unlocks automatically as that person with the virtual key approaches the door. Let’s say the mother-in-law is in town for an extended visit, no need to get the key cut, she can be all up in your grill for the duration of her stay without even having to touch the door or lock it when she leaves. If it’s all become a bit too hot in the kitchen you can rescind her invitation, so when she goes out for a stroll, she won’t be able to get back in. There’s no need to be that nasty, but as you can imagine, there’s a whole world of possibilities there. The whole process is automated as soon as the invitation is sent and Bluetooth activated. “It relies on the same secure communications technology used by financial institutions for online banking, giving only desired individual’s access to your property for set amounts of time,” said August co-founder Jason Johnson. Like Nest, you can expect August to be snapped up by one of the big guns for a hefty price tag in the race to own the connected smart home. Ultimately, this is where the big money will be made and lost in the coming few years, through investing in technology that once we would never have thought of connecting to the internet or to Bluetooth. It’s not about imagining a future where everything is done for us, it’s about a future where technology simply blends in and replaces old, inefficient ways of using energy when it’s not needed. As long as it’s elegant and simple to use it’s likely to find a target market. There is undeniably a concern over who owns this data, especially when billion dollar multinationals like Google and Apple can simply buy you out. Industry regulations will have to be established to meet the big-data outcomes of the smart home so as to prevent out and out exploitation for advertising purposes, but that day in court will undoubtedly come soon. But for now, while it remains in the not too distant future of feasibility, it’s a good view towards the battlefield of the connected smart home.